Pictures may be used non-commercially with credit given to photographer. 1. Refinery burning oyster shells to make lime; canal in foreground; inland sea in background in Enkhuizen, The Netherlands, which is just north of Amsterdam. The refinery is part of this working village recreating the 'golden age'of the 17th century. July 2001. 2. The Windmill De Gooyer, Amsterdam, The Netherlands. July 1999. 3. Zwolle, The Netherlands, east of Amsterdam: unbelievable balancing act; the rock being supported is at least 20 feet long. April 2002. 4. Bronze on street in Düsseldorf, Germany, March 2000. 5. Along the bank of the Rhine River in Düsseldorf, Germany, March 2000. 6. Groningen, The Netherlands - one of the northern-most towns in the country. March 2001. 7. The Maas River going through Maastricht, The Netherlands, the southern-most city in the country. To the east lies Germany, to the south and the west is Belgium. February 2001. 8. Sand dunes in the Hoge Veluwe National Park in the east of The Netherlands. August 2001. 9. Paris, France. 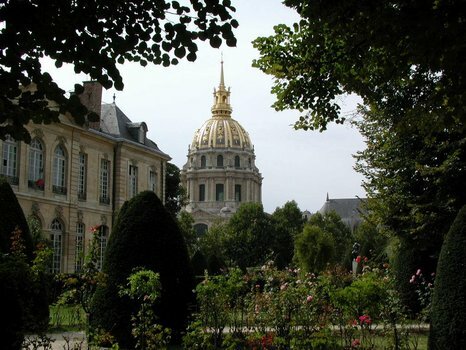 Musée Rodin at left with a view of Hôtel Les Invalides in background which was built to house 4,000 wounded soldiers. (Rodin's "The Thinker" sits in this front garden, barely visible - 100 pixels up from bottom and 125 pixels in from right side of photo - a red rose at the base of statue.) September 2001. 10. Le Louvre, Paris, France. The largest museum in the world; formerly a royal palace. Viewed from inner courtyard. September 2001. 11. J. B. Carpeaux: Le prince impérial et son chien - 1865. Marble statue of prince with his dog. Musée D'Orsay, Paris, France. September 2001. 12. Fair Oaks on the Magothy, Severna Park, Maryland. The Magothy River is a tributary on the western side of the Chesapeake Bay between Baltimore to the north and Annapolis to the south. Looking across the river is girl scout Camp Whipporwill. The tributary just in front of the camp to the left is the 'Little Magothy' and the middle tributary is 'Cattail Creek', while the closest body of water to the left is a cove in Fair Oaks. This scene is the beginning of the fullness of the Magothy; the mouth into the Chesapeake Bay is 5 miles south-east to the right. September 2000. 13. Farm just west of Skyline Drive in Virginia USA. September 2000. 14. Farm in southern Pennsylvania USA. September 2000. 15.Cornfield in Ohio USA. September 2000. 16. Skyline of Chicago, Illinois USA, in the mists of Lake Michigan, May 2002. 17. View from Mississippi River of St. Louis, Missouri USA. September 2000. 18. The Mississippi River further south between Arkansas and Tennessee USA. September 2000. 19. Pastoral setting in Oklahoma USA. September 2000. 20. Cattle on a plain in the Texas USA panhandle. September 2000. 21. The Continental Divide just west of Albuquerque, New Mexico USA. September 2000. 22. Mountains ascending through clouds viewed from 35,000 feet elevation over western United States of America, May 2001. 23. Sedona, Arizona USA. September 2000. 24. Stan Schaap standing at over 12,000 feet elevation on Mt. Shasta in northern California USA. September 1999. 25. Joshua tree; Mohave Desert, California USA. September 2000. 26. Dimly on the horizon a view of Santa Cruz Island in the Pacific Ocean, one of the Channel Islands off the coast of Santa Barbara, California USA. Picture taken from atop San Marcos Pass at 3,400 feet elevation. May 2002. 27. From atop the Santa Ynez Mountains behind Santa Barbara, California looking west. To the south is the Pacific Ocean and to the north is the Santa Ynez Valley. Just to the north of the further-most peak in the center of the picture Lake Cachuma is barely visible. This was a panorama shot of 2 photos stitched together taken by Stan Schaap with an Olympus Camedia digital camera C-3030 Zoom. May 2002.